The Strategy provides access to high-growth global opportunities in environmental themes focused on four environmental themes: Energy & Power Technologies, Waste Management & Pollution Control, Water & Wastewater Solutions and Health & Well-being. As the world transitions to a sustainable economy, the Strategy seeks to capitalize on this transition. For investors seeking access to companies offering solutions to key sustainability issues. For investors who desire a disciplined, responsible investing strategy but still seeking the potential benefits of global diversification. A disciplined, fundamental bottom-up approach to responsible and sustainable investing from an experienced Sustainable Investment team. The Strategy is focused on companies categorized within four major themes: Energy and Power Technologies, Waste Management and Pollution Control, Water and Wastewater Solutions, Health and Well-being. We believe companies focused on innovative products and services that simultaneously improve quality of life and environmental circumstances are being increasingly rewarded by investors. We also believe that sustainable technologies represent a faster-growing opportunity set in the market. Our sustainable investment specialist team has defined high-growth environmental themes which have been further honed through collaboration with the additional research teams from the AGF Global Analyst pool and shared firm research. We believe that industries evolve according to powerful themes and remain GICS-agnostic in our approach, investing in companies offering solutions to key issues of sustainability. The result is a high-active share portfolio that we believe enhances our ability to capitalize on inefficiencies in this segment of the market. The investment process is based on a fundamental bottom-up approach. 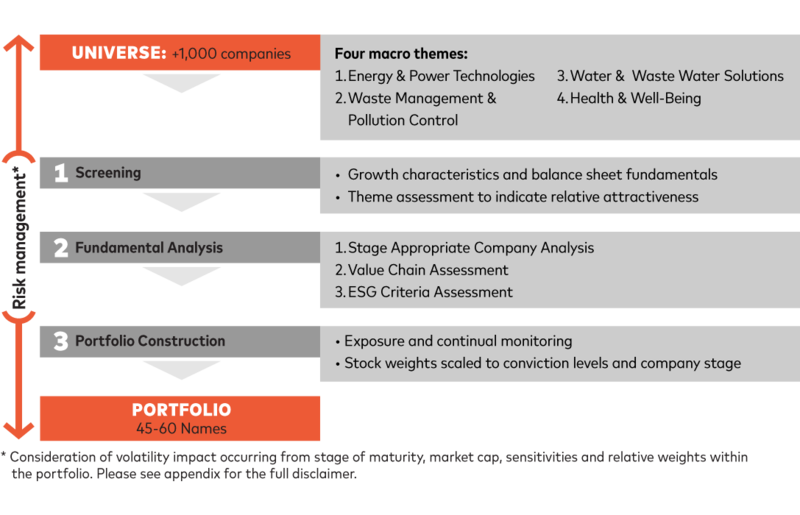 Four environmental mega themes are used to establish the investment universe. Within this universe, the team seeks out opportunities that either provide exposure to high-growth environmental themes or ‘catalysts’, or that have been identified within the undervalued segments of a particular industry’s value chain. Typically, the catalyst is technology or product-related and is a definable environmental advantage, or the catalyst is expected to have an impact within 18 months. Idea generation efforts are focused on two areas: fundamental strength and free cash flow. Once a list of candidates is identified, the team conducts a comprehensive assessment of the security’s future performance potential. This process includes discussions with company management, to develop a deeper understanding of its business strategy and the stability of its business model. Using internal and third party research, the portfolio manager assesses security valuation by determining the underlying financial quality, profitability, balance sheet strength, earnings quality and cash flow. Our portfolio construction process is driven by our bottom-up security selection process. Our portfolios represent the portfolio manager’s best ideas and reflect conviction on a security and sector level. Investing involves risk including loss of principal. Equity securities are volatile and can decline significantly in response to broad market and economic conditions. Investments in global equity may be significantly affected by political or economic conditions and regulatory requirements in a particular country. International markets can involve risks of currency fluctuation, political and economic instability, different accounting standards and foreign taxation. Emerging or frontier markets involve exposure to economic structures that are generally less diverse and mature. The less developed the market, the riskier the security. Such securities may be less liquid and more volatile. The universe of sustainable investments may be smaller than that of other funds that do not focus on sustainable development issuers. The Fund may forgo opportunities to gain exposure to certain attractive companies in certain industries and sectors, such as fossil fuel producers, and may have a reduced weighting in others, due to their lack of positive exposure to sustainability themes. Because of these themes, the Fund may underperform the market as a whole if such investments underperform the market. Martin Grosskopf has more than 20 years of experience in financial and environmental analysis. He is a former Responsible Investment Association (RIA) board member, and is a frequent public speaker on ESG issues. In addition to the portfolios that he manages, Martin provides input on sustainability and ESG issues across the AGF investment teams. Martin obtained his B.A. from the University of Toronto, MES from York University and an MBA from the Schulich School of Business. Martin joined the financial industry after working in a diverse range of industries in the areas of environmental management, assessment and mitigation. Martin was previously Director, Sustainability Research and Portfolio Manager with Acuity Investment Management Inc. AGF Management Ltd. acquired Acuity Funds Ltd. and Acuity Investment Management Inc. in February 2011. He was a project manager with CSA International from 1997 to 2000 and prior to that, was an environmental scientist with Acres International Limited. Registered as a Portfolio Manager under AGF Investments Inc. and AGF Investment America Inc.